Gally Apartments Vienna provide clean, bright and cozy apartments for the budget traveler. 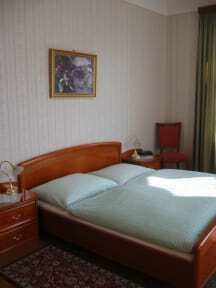 In addition to the cozy atmosphere, special attention is paid to the cleanliness of the accommodation. Free WIFI access is available in each apartment. Free of charge for every guest: City map, leaflet of the museums, program of events & sightseeing information. Free lockable bicycle storage. Free of charge and on request: irons, ironing boards and hairdryers. Guests can use a laundry-room. As of October 2012, the parking management system in Vienna was expanded to our area. If you come by car you also should consider to rent a private parking space if needed. Private parking costs 5 euro per night. The Apartments are located in Arnsteingasse 25 in Vienna, in between Westbahnhof and Schloss Schoenbrunn in a little street off of Mariahilfer Strasse. Shops, Restaurants and Bars are in the surrounding area and there is easy access to public transport which will get you to all the sights of Vienna. We offer Standard-Apartments with one bedroom for up to three persons and Family-Apartments with two bedrooms for up to four persons. The apartments are strictly non-smoking. 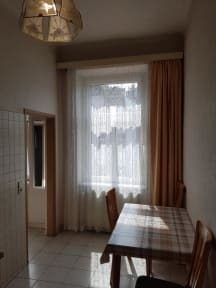 All apartments have bed/living room(s) with direct-dial telephone, sat-TV with several English channels, radio-clock, a bathroom (shower or bathtub and toilet) and a fully equipped kitchen (electric stove, microwave, fridge + freezer, coffee-maker, abundant cutlery, china, glasses...). Elegantly furnished rooms, tiled bathrooms and a fully equipped kitchen for your self catering stay leave nothing to be desired. Check in from 11:30 to 23:00 . Please let us know your estimated arrival time in advance and as soon as possible. On the right side of the entrance door there is a key box, in case the we are not there or the guests arrive late.